[Updated with video] The master development agreement between the Government and the Desarrollos Hotelco Group has been finalized for the hotel project in St George’s, the Government announced at a press conference this morning [Oct 20]. Those in attendance included Premier Michael Dunkley, Minister of Tourism Development & Transport Shawn Crockwell, Public Works Minister Craig Cannonier, MP Kenneth Bascome, members of the Desarrollos Hotelco Group and others. Minister Crockwell said, “I am very pleased to announce that the Bermuda Government and the Desarrollos Hotelco Group have finalized the master development agreement for the St. George’s Tourism Development site. “”This development has the potential to spur other developments and provide exponential employment opportunities for Bermudians. “It is crucial to Bermuda, and it will have a positive impact on tourism, and therefore our entire island. “The Desarrollos Hotelco Group is more than capable of developing the St. George’s site into a world-class, full-service resort, and we are very excited to have them as our partner,” added Minister Crockwell. In July of this year Minister Crockwell tabled the St. George’s Resort Act 2015 in the House of Assembly, with the Ministry saying the proposed $120 million development will include 122 hotel rooms, renovation of the St. George’s golf course, up to 90 condominiums and a casino – which will be subject to an application to the Gaming Commission. The press conference has just concluded, and we will update with the full information and a video as able. Cabinet Colleagues, Parliamentary Colleagues, representatives from the Desarrollos HotelCo Group and the Bermuda Tourism Authority, ladies and gentlemen. Today is indeed a very significant day for Bermuda and in particular for St. George’s, our world heritage site. 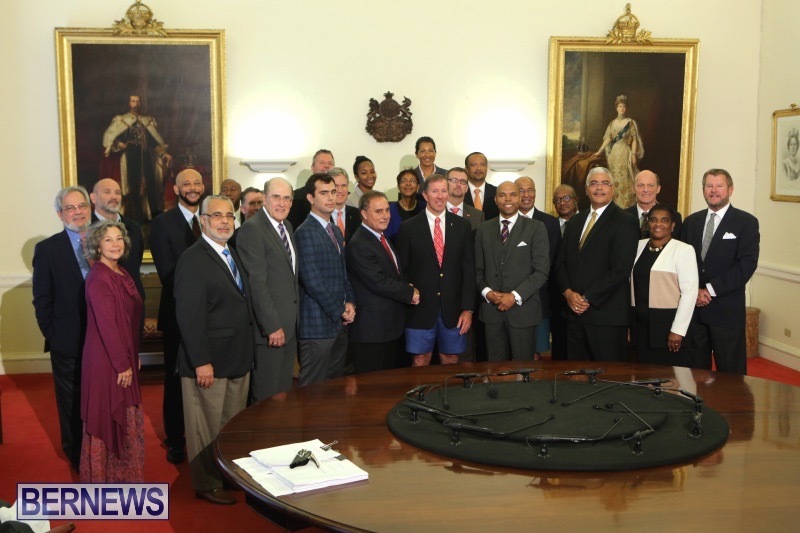 It is a day that has been a long time coming and a very welcome development for this Government and the people of Bermuda. I am very pleased to announce that the Bermuda Government and the Desarrollos Hotelco Group have finalized the Master Development Agreement for the St. George’s Tourism Development Site. Our government and Bermuda Tourism Authority team have completed all of the negotiations with the developer, finalizing specific terms and conditions. All of the I’s have been dotted and all of the T’s have been crossed … it is full speed ahead from here and I am sure the residents of St. George’s and indeed everyone in Bermuda is just as excited as the OBA Government to see this project reach this critical milestone. The Desarrollos Hotelco Group has a proven ability to deliver world class resorts. We are very confident that they will continue that reputation as they construct and operate a world class luxury resort development on the 124 acre St. George’s Tourism Development Site. A resort development that Bermuda has anxiously anticipated for some time and a development that we will all be very proud of. This Government made a promise to develop a resort in the east end and it is a promise that we are keeping. As previously stated, this development has the potential to spur other developments and provide exponential employment opportunities for Bermudians. It is crucial to Bermuda and it will have a positive impact on tourism and therefore our entire Island. The Desarrollos Hotelco Group is more than capable of developing the St. George’s site into a world class, full service resort and we are very excited to have them as our partner. Signing this agreement today is another significant milestone in advancing this initiative and comes as a result of extremely hard work and dedication. Again, I would like to thank everyone for their hard work and commitment to this process. The Permanent Secretary, Mr. Francis Richardson of the Ministry of Tourism Development and Transport, Mr. Myron Simmons of the Attorney General’s Chambers, the Bermuda Tourism Authority, specifically the Chairman, Mr. David Dodwell and Mr. Andy Burrows, head of the Investment Division and our consultant on this project, Mr. Ronald Sutherland. As a tourism destination Bermuda is up against the world. There are things we must continue to do to compete and to create an environment that encourages and incentivizes developers to invest in Bermuda. As I said before, the St. George’s Tourism Development Site is exciting for Bermuda as the benefits of this development are significant to the revitalization of our tourism industry, the St. George’s community and Bermuda as a whole. This world class resort facility will be managed by the St. Regis, Starwood Hotels & Resorts top luxury brand. A brand that is synonymous with elegance, sophisticated comfort and premiere destinations. This resort development will attract potential visitors who like exceptional experiences and who like to stay at resorts whose names they recognize and trust. We are thrilled with our partnership with the Desarrollos Hotelco Group and we are all looking forward to seeing development in St. George’s commence soon. Today is indeed significant and I share my colleague’s excitement in the signing of the Master Development Agreement and the Ground Leases for the St. George’s Tourism Development Site. This is a crucial development for Bermuda. This is a project that will enhance our product, create jobs, and have an overall positive impact for the entire island and our visitors. The Ministry of Tourism, Development and Transport took the lead on the St. George’s Resort Development and the estates team of the Ministry of Public Works was asked to provide technical advice to the Attorney General’s Chambers on the Ground Leases for the St. George’s Tourism Development Site. I would like to thank the estates team for their assistance in providing technical advice to the Attorney General’s Chambers in the drafting of the Master Development Agreement. There was quite a lot of work to be done to help complete this agreement and they performed admirably. I would like to congratulate the Ministry of Tourism Development and Transport, the Desarrollos Hotelco Group and everyone who was involved in bringing this project to this point. It is great to see us advancing this project and I too am looking forward to seeing this development commence. Need one say more? Job well O.B.A. Great News for St.Georges and Bermuda’s Economy. This should transfer into Jobs for Bermudians. Now I cannot wait to see the soil turnover! I actually will congratulate you Betty for once you have taken the high road!!! Now if you can only get the rest of your plp party colleagues to at least do the same, up until now, their silence speaks volumes, in fact they have been silent on the AC stuff this past weekend as well?? Do you think reality has now sunken in and they realize all these successes were out of their league to achieve???? Keep in mind Kangcaroo/Westpalm/Lawnmower man that there is NO actual financial gains that are measureable at this stage of the game ….it is much too soon to tell. What you and many overlook is that if one critically examines, Analyzes, researches, scrutinize and evaluate an issue or project, this does not automatically translate into they are not for something…….they are doing what most intelligent individuals would do. To blindly except what any government does is not acceptable, regardless of one’s political affiliation……Examine the all the factors related to a situation carefully in a critical manner is what should be done…….. ………after all it is the people’s taxpayer’s money at work here on most projects………. Further, we cannot project what the real outcomes is at this stage of the line, as the economic benefit to Bermuda is yet to be told. I do not believe it will be known until after AC 2017. That is when we will begin to get significant data on the real outcomes of this event in terms of the real or lack of real financial returns to Bermuda. Sure we can see that folks had a good time this weekend. The Race was wonderful. We can measure by the look on some folks’ faces the Emotional Feelings and moods of the AC, but that again is subjective…… but the REAL WINNER for BERMUDA Is the Impact this will have on our ECNOMONY in the LONG-TERM………we must not be silly to overlook that. Now the Hotel….many attempts……. difficult during this economic downturn for any country….. Some unreadiness will be until the soil is turn up and brick in in the ground….some until they see a completely built hotel….I am sure you can relate to many, many folks feelings on this one……………….too soon to tell again….but hope for the best………………….my hope is that Bermudians will be given first opportunities …………..
love ya too…..but must be realistic as well……………………………………………..
Master plan? Was this tabled? Yes it was Onion Juice. You happened to sitting at the table drinking Koolaide with the others. Your so lucky living in a Country that is coming back from the brink. The boarders to Croatia are open if you need a raft to get there. You give the onion a lot of credit, i would bet he has no idea what or where Croatia is and whats going on there, although I think he should go and see what the REAL world is like. Actually I do know where it is and luck has nothing to do with me living here, as a matter of fact you should be lucky, as Croatia might be the land of your ancestors. Chip’s here. Start the party. Investment, new jobs, new hotel. Great for Bermudians. You hate it don’t you. And still no shovel in the ground yet. Alway the negative. Just how much do you really want your Island to prosper. I have to wonder. When did you expect them to have the shovels in the ground since everything was just finalized? Yesterday? Maybe today? That’s the expectations; hey they wanted the economy turned around in two and a half years. That’s the armchair financial geniuses you’re working with. You’ll have to forgive umok. He is used to the plp’s way of doing these things. You know, have a big shovelling photo op and then spend years trying to seal the deal – of course they never did seal the deal. No wonder there are so many sceptics…The OBA have sealed this deal. How long has it been since a new hotel has been built in Bermuda, 40 years? The OBA are certainly on a roll. The East End is about to experience a boom with the hotel and the airport too. The West End will have their’s as well, with all the AC35 activity. Maybe finally some who could not see the VISION and PLAN are beginning to see it now too. From an economy in a death spiral to an economy on the rise. old Ewart promised shovels in the ground every December …. @Navin, or election time, whenever he felt like saying it or whenever a scandal involving him erupted???? What an a*** you are. They use bulldozers and all that good stuff to get the earth shaking. Yeah, normally they sign the development plan, then build. Rather than build first, then at some later point do the planning. Unless it’s Grand Atlantic. That was the other way round: build first, then try to find a use for it. Those days are gone though. OBA……taking care of business, well done guys! lol @ Kudos. Looks like ya Dislike button got stuck bie…. I can’t see the island electing the opposition into government in the next 2 1/2 years. While I didn’t vote for the OBA it is clear they have had a string of success over the last few years. I may not agree with all of their policies, but there is no denying the progress. May the island continue to prosper. Getting it done. Organised, delivered! NO ONE else could have done it! This is is all well and good BUT they haven’t given any indication of when the development would start. You would have expected them to give some sort of rough guide line like…. In the next 3 months, 6 months etc……. I also didn’t hear them address the financing of the hotel. Has this been done? If not it could take quite a while if they can do it at all. Look at the last developer. I hope this happens because it would be great for Bermuda but I think it is too soon for the party. Sort of like when Ewart told us “ground will be broken on the Grand Hyatt in November 2011″? That sort of rough guideline? Yeah, I can see how that would be really helpful. Construction will start early the new year. Listen to the press conference, They clearly said clearing to start by end of year and development to start early next year! i know, you and the rest of the kool aid drinkers dont want to hear! Go dream up a new laughable scandal for us! The reality is no one in their right mind would or should build a hotel in St. George. Build a cruise ship terminal off of Fort St. Catherine and meet demand where it is – cruise ship visitors. Hopefully now they’ll fix the two bridges down the east now. yes the PLP/BIU will get back in again as you only have to take a look at CANADA which has had 9 years of the Conservatives cleaning up the mess that CANADA was in and people got tired of that. So they changed the Goverment whom has said there platform is to TAX THE RICH AND HAVE THREEYEARS OF GOVERMENT SPENDING. Unfortunatey people are stupid enough to believe that some politions will give them FREE STUFF.No No we dont want to work for anything that we need especilly when Goverment will give it to us. Congratulations to Bermuda, for one we had faith to make a change at the polls and now we are seeing that with a little effort we can see wheels starting to turn. St.George’s has been forgotten but with this new development I am sure the Police Station and Volunteer Fire service will be restored as permanent fixtures. The Bermuda Government, and Bermuda in turn, is really firing on all cylinders right now; the ACWS was a massive success and preparations for 2017 are well underway; the St. George’s resort project is seemingly a go, as is Morgan’s Point; Pink Beach is nearing completion; the (understandably controversial) airport project is in the pipeline. Some major companies have moved or are in the process of moving to Bermuda. That, and retail sails have been up for 12 months, unemployment is down, and GDP up for this year nearly 4%. It’s been a long while, but I’m finally optimistic for Bermuda’s future! So great! Great Job OBA.. the sad reality is that I/we as a bermudian with experience and education can’t even get a leading position/Job in the hotels that are already establish in bermuda and support our own. Building this hotel will be another Grotto bay /Fairmont and Southampton where the 5 highest paid employee with housing are all expat and the ripple effect are there friends with 6 figure salaries. Maybe the GM at Grotto Bay can transfer there and stay another 20 years and dismiss another 318 bermudians ?? Wake up Minister Fahy the struggle is real !! Well your lack of correct spelling ( i.e use of Capital letters ) would indicate why you may not be a 6 figure hotel executive. Education my friend then WE Bermudians can advance. Oh please boo hoo , if you were any good you would get a job . bottom line. No Corporation in their right mind would build a five star hotel on the proposed site…. A cow pasture in their back yard, the hood and swamp in their front yard,etc, etc,……..I smell a dead rat somewhere. Put a university on that site……. From now on till the next election we will hear , next month , it’ll start next month . In 2017 I’ll still be saying to my old friends from the Club Med days … Nothing yet ! Is that a bit like saying ground will be broken in November 2011? I can see how believing Ewart would have created some disappointment. Hehe …. Good one . However , now the language has changed to I’s dotted and T’s crossed , which translates to money on the table ! But will it be enough to put shovels in the ground ? Yes coffee it will!!! Just sit back and watch how the pros do it!!! You will see a huge difference between the ” what’s in it for me plp ” and the ” what’s good for ALL BDA ” OBA!!! Maybe you could have made that claim BEFORE JETGATE , but now just more unproven and dopey protectionist noise from you ! Oh right. Now make sure you listen in carefully when Parliament starts up. Shawn has some fun facts about former Ministers taking private jet trips paid for by developers. He did a nice bit of digging. Should create a nice bit of histrionics from certain Members. Can’t wait. The hypocrisy is too much some times, but most have realized or are awakening to the fact that the opposition are just full of it and it shows more each day. The developer has a very good track record of delivering. When they say they are going to build they build, unlike another developer I can think of. Sorry to disappoint you. Get used to this upbeat economic outlook. More to come. Please pay attention to elevations…ie. If you have a three story building please be sure you have three elevations on three sides (for ease of access),for expediation of furniture,people,services,access and parking and or shuttle service and or emergancy services.It looks more attractive and is more functional.without elevators or service elevators you pretty much need a lift just to take luggage.Just a thought to assist in keeping operating costs down.Solar lighting…wind generator to battery as well for night lighting combined with led lighting options.Ccttv systems with battery back up.Good luck and welcome. This is great news for the East but at what cost? Are we going to lose a government school with a rich history for the hotel? Where exactly is this hotel being built, because it seems to me that closing East End Primary School has a lot to do with this hotel development. How is public transport in going to be affected because if the hotel is being built by Fort St. Catherine there is no public transportation that goes that route. Are they going to shut down other businesses that might not meet the status quo in that area? You shouldn’t just be planning for a hotel, but also seeing how it will affect the entire parish. What is the vision for the entire town? Will there be any businesses in St. George’s by the time the hotel is opening because right now there are hardly any stores. What is the plan, what is the vision?